Maserati reveals new Quattroporte | What Car? Maserati has revealed the new Quattroporte ahead of its debut at the Detroit motor show in January. The sixth-generation of the luxury four-door model is the first of three new Maseratis to be launched, and the company hopes the trio will boost its global sales to 50,000 up from just 6200 in 2011. Few details have been revealed ahead of the new Quattroporte's motor show unveiling, but Maserati has said that the cars engines have been jointly developed with Ferrari. The new Quattroporte is expected to be launched with a version of Ferraris 4.7-litre V8 petrol engine, albeit with lower CO2 emissions and improved power and fuel economy figures. More engines will join the range later, with a V6 model expected to be added, and a higher-powered 4x4 version likely to be offered for the first time. The new car will be longer than the current Quattroporte, which should provide more legroom for rear passengers making it a credible rival to the likes of the Mercedes S-Class. Despite the increased dimensions, the new Maserati is expected to be lighter than the previous model. 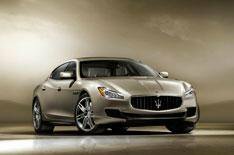 Pricing for the new Quattroporte is set to start at around 75,000, when the car arrives in the spring. Maserati will also launch a smaller saloon, which is likely to be called the Ghibli, and will be a rival to the likes of the BMW 5 Series. This will be based on a shortened Quattroporte platform and is expected to offer a diesel engine a first for a Maserati. It will go on sale in mid-2013. The final new model will be an SUV. This will be called the Levante, and it is expected to go on sale in 2015. This is the production version of the Kubang concept car that was revealed at the 2011 Frankfurt motor show.